No stranger to the Delta, Tamicko Ransome Fair was born and reared in Greenville, MS. Tamicko received her Bachelor of Social Work as well a dual Masters Degree in Criminal Justice and Social Work from Mississippi Valley State University in Itta Bena, MS. She’s licensed to practice Social Work in the State of Mississippi and Tennessee. She is also certified by the Mississippi Children’s Advocacy Center as a forensics interviewer. Presently, Tamicko works as a licensed forensics social worker and grant writer with the Fourth Circuit Court District Attorney’s Office where she serves as District Manager under the direction of W. Dewayne Richardson. 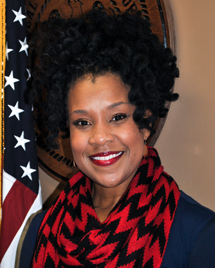 Her professional memberships include the National Association of Social Workers, the MS Chapter of Social Workers and she is a member of the Prosecutors Association where she serves on the Board of Directors. She also serves on the Board of Directors for the Greenville Renaissance Scholars and is a member of Delta Sigma Theta Sorority, Inc. Mrs. Fair is happily married to Dr. Byron W. Fair. Tamicko lives by the creed, “The best way to find yourself is to lose yourself in the service of others”.